Weekly update: so, so close to $26,000! Oh, we’re so so so close to $26,000! We’re at $25,784, including $24,209 and $1,575 from direct and matching donations to the GBS/CIDP Foundation.There’s a huge opportunity there for someone to take us to half way and get their name in lights! Weekly stats: 49.6% of the way to the $52k goal, and still 33% of the way to the running goal of 52 races. Always a great question! Well, my good friend and colleague from Redbubble, Barry Newstead, donated a generous $200 to the campaign. He deserves a ton of thanks for helping out patients with GBS and related conditions! Onya Barry! I ran absolutely no races on the weekend! Instead, I flew from San Francisco to Buenos Aires, and settled in with the family for three weeks in a Spanish immersion school. It’s already been an amazing experience, and you can follow along with our daily blog posts over at http://thewilliamsadventure.com. I’m looking for a race for this weekend, and I’m optimistic you’ll be seeing some race times from South America soon! The picture above is Selina and I taking a run around Buenos Aires today. 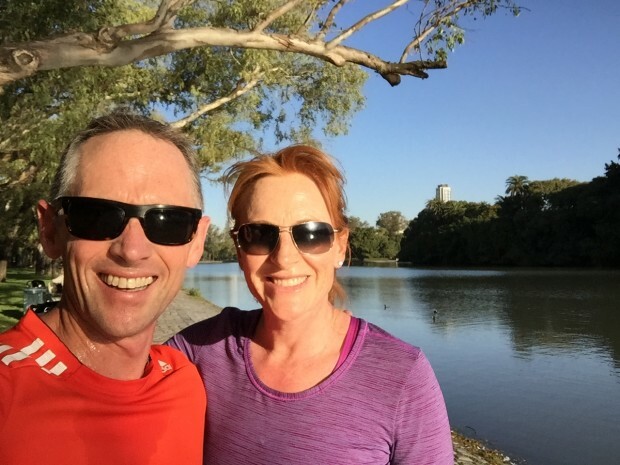 What a fun city, and what a great day for a park run! Previous PostWeekly update: 17 races run, and 49% of the way to $52,000!Next PostWell, hello there, $26,000!